Kangaroo care is the practice of holding your diapered baby on your bare chest if you're the father or between your breasts if you're the mother. Make sure you have a blanket draped over your baby's back. This skin-to-skin contact has great benefits for both you and your baby. Kangaroo care ensures your baby experiences your scent, touch, and the rhythms of your speech and breathing, and he/she will enjoy feeling that closeness with you. The baby's head must be dried immediately after birth and then the baby is placed with a cap on the mother's or father's chest. Babies should maintain skin-to-skin contact method for about 3 months so that both the baby and the mother are established in breastfeeding and have achieved physiological recovery from the birth process. For premature babies, this method can be used continuously around the clock or for sessions of not less than one hour in duration (the length of one full sleep cycle). It can be started as soon as the baby is stabilized, so it may be at birth or within hours, days, or weeks after birth. 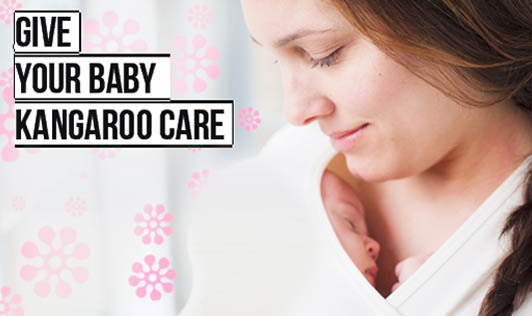 Even if your baby is very small or sick, kangaroo care must be given to the baby. 2.Regulate heart and breathing rates. 4.Spends more time in deep sleep. 5.Spend more time being quiet and alert and less time crying. 6.Have a better chance of successful breastfeeding. 2.Ensures physiological and psychological warmth and bonding. 3.Provides ready access to nourishment. 5.Builds your confidence as you provide intimate care that can improve your baby's health and well-being. You may be a little nervous about trying kangaroo care, don't be! Kangaroo care is a precious way to stay close to your baby and enjoy parenthood.